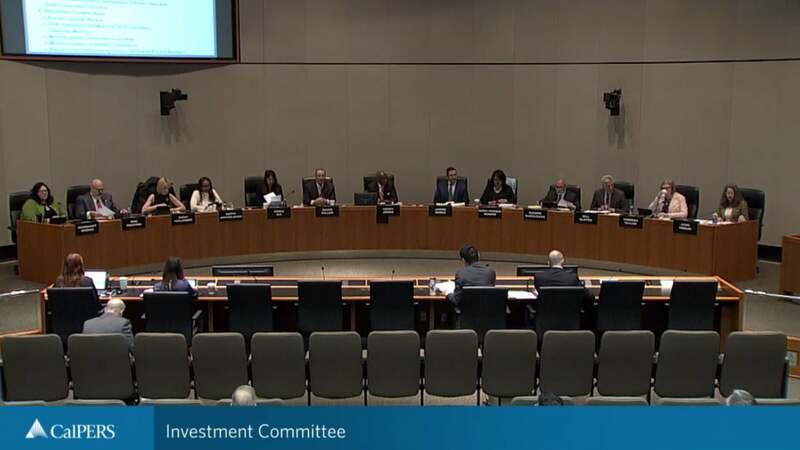 CalPERS’s March 2019 Investment Committee reviews investment transactions, the investment performance of both internal and external managers, and establishes investment policy and strategy. Next item on the agenda is the executive report. And just want to make a comment. For a start committee members may notice that the materials and I want to complement the staff the materials presented are concise and focused on the issues that are most important to us in her oversight role. And yet at the same time in addendum detail material is provided as well. So thank you for that. With that I’ll turn it over to our Chief Investment Officer Ben. Good morning. Good morning Mr. Chair, Members of the committee, we have several important items on the agenda this morning including a number of items requesting action by this committee. So first Item 7B the bill seek to increase CalPERS reporting our engagement of emerging managers. Second item 7B. The bill is about divestment of securities private prisons. After Item 7A and B [inaudible] B will take place after NYC. So next item 8A of the agenda will continue to [inaudible] over the committee and the staff over the last 18 months. Regarding changes to CalPERs private equity business moto. Before we move on, I just want to underscore that request to action on item 8A is not an approval of any specific investment transaction or contract. Now it is an override exception to our existing investment policies. Rather today’s item asks the committee to affirm our commitment to updating CalPERS private equity business moto through the adhesion of two new pillars. One focus on a late stage venture and the [inaudible] strategy and the other focus on a long hold strategy. In the course of our deliberations over the past 18 months and the accompanying popular media commentaries and the speculation a certain degree of confusion has arisen in the financial markets. Particularly in regards to our commitment to this project. So today’s item staff seeks affirmation from the committee regarding further exploration of Pillar 3 and 4 innovative options we believe could materially [inaudible] in our fund. These affirmation is important, as we believe attempting to continue this audit would compromise this important endeavor leaving potential partners unsure of our intent. [inaudible] further development of Pillar 3 and 4 today will help ensure CalPERS is able to bring potential partners to the table. Now moving on to agenda Item 9A and 9B will receive update from our corporate garments and the sustainable investment teams. We reveal how CalPERS is leveraging our stakeholder rights in alignments of our governance and the sustainability principles. And how we continue to integrate sustainability issues into our investment decision making process. And finally following up on the committee’s request as the February meeting, we will have an introductory overview of a CalPERs active divestment mandates, as well as some additional exploration of how we will share associates estimates the economic impact of these divestment on the portfolio. So I would like to take sute spend a few minutes on the recent to fund the performance so that you have the number based on the end of January performance number. By the time of publish over these material that was the data available to us. Now they have updated them as of the end of February. So as you may remember last time was in December when Eric Baggesen, who was the interim CIO during the interim period. The performance number he gave you as of at the end of December the physical year the total funded return was negative was 3.54 Percent. I’m glad to report back to you that after two months the first two months of 2019 the market has done well and so have we. So as of the end of February the total fund return a positive 1.62 Percent. However our required rate of return alone rise 7 percent. So means of falling short of 5.4 Percent to be made up in the remaining four months of physical year. And yesterday we did a historical simulation assuming that using the 60 40 portfolio and means 60 percent of S&P 500 40 percent of Barclay ag.